The sun was setting, lengthening the shadows and giving Starfleet Academy a beautiful, orange glow. This was Captain Anton Schaefer’s favorite time of day. Normally, it would be time to pack up, go home, maybe visit his favorite little Italian restaurant in North Beach, and see what kind of trouble he could get himself into. As a Starfleet Captain and an instructor at the Academy, it usually wasn’t much. Most nights, he would be about to order when a gaggle of his students would wander in, eyes wide that their teacher was a human being who had a social life, too. But tonight would be different. He loved that magic hour light, but it was getting too dim to see the mountain of paperwork he still had to go through before he could turn in for the night. “Computer, lights.” He said. There was a small buzz, and his office lit up with harsh, white light. He blinked and shook his head, closing his eyes until everything adjusted. He liked to keep things comfortable, relaxed even in his office. Hell, in his younger days he might’ve even unbuttoned the top of his uniform on a night like this. But there was tension in the air, and it weighed on every part of this hallowed institution. To be casual now would be to seem like he didn’t care. Three days ago, the U.S.S. Shenzou had encountered a Klingon ship in a binary star system on the outer edge of Federation space. A combination of failed diplomacy and, of all things, an on-board mutiny had lead to the first major conflict with the Klingons in over a decade. The Battle at the Binary Stars, they were calling it. Four days ago, his classes had been looking forward to a future of exploration amongst the stars. Now, Starfleet was at war. Schaefer knew what was needed – he’d gotten into plenty of scraps out there in the black, before he settled down here to teach. These kids were bright, and enthusiastic. One red head cadet in particular seemed to see the whole world with an infectious optimism. He hated to see them beaten down by the terrors of war. Schaefer stood up, and walked to his window, looking out onto the lights of San Francisco, twinkling in the distance. All right then, if the universe was going to beat these kids down, he could show them how to spit in its eye. Humanity had a place up there, in the whole wide universe, and he’d be damned if the universe was going to crush his cadets down. Let ‘em shine bright. Weeks after the Battle at the Binary Stars, a lot has changed for the Federation, and for your class of 2256. The galaxy is still in turmoil over the beginning of war with the Klingons, but today is a day for celebration. You and your friends, including underclassman Sylvia Tilly, will be taking your first steps into the Final Frontier. It’s a training cruise, just to get your feet wet. With the launch of Age of Discovery, you’ll be able to create a Discovery Era Starfleet character. 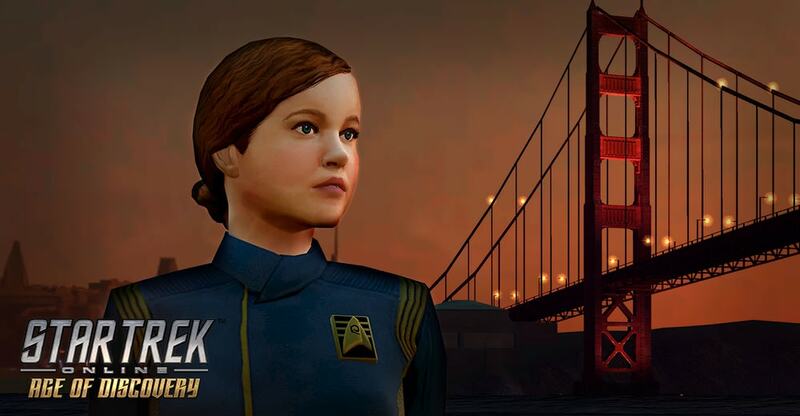 Choose from a few Discovery era races, head out into space on a Malachowski-class Starship, and experience a reimagined starting experience that will begin a new journey in Star Trek Online. We can’t wait for you to boldly go where no one has gone before.